PaAAEL’s meetings contain pertinent information for laboratory members including relevant topics for instructing our members in different aspects of the laboratory industry. A representative of the Pennsylvania DEP accreditation program is always invited to speak at this meeting as well. PaAAEL’s meeting may also include training seminars to provide laboratories an inexpensive outlet for the training of their laboratory personnel. PaAAEL is able to provide CEUs for Pennsylvania water and wastewater operators at some of these seminars. PaAAEL holds three meetings per year usually on a Tuesday in March, June and December. Suggestions for topics are always welcome and appreciated. 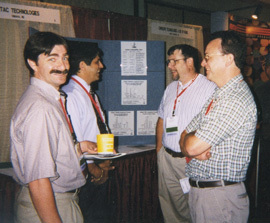 The PaAAEL Annual Convention and Exposition is held every fall. It is a two-day convention coupled with a trade show featuring industry representatives from all over the United States. Two sessions running concurrently provide training by industry experts on topics of interest to the laboratory community. This convention is designed to fill the needs of small to medium laboratories and stay within their training budget.